Harriman is happy to announce its work in crafting the Business Guide for the Town of Dedham was recognized with a 2013 Planning Project Award from American Planning Association, Massachusetts Chapter. 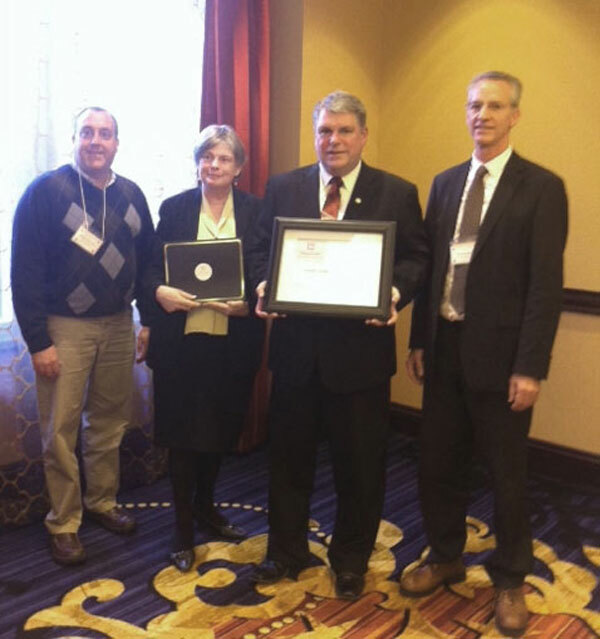 The award was given this past December at MA APA’s annual awards gala. Small businesses are the key to creating vitality in town centers, yet towns often create unnecessary barriers through highly complex processes and missing or unclear directives. To better promote investment by small businesses, towns must reduce the risk in the start-up process by better communicating the steps that must be taken and offering support services, such as information on where to obtain permits, and grants or other financing. For Dedham Square, where a significant investment has been made in street improvements, the Town recognized the need to improve the business climate in order to fill storefronts and support existing businesses. These were among the reasons the Town created the Dedham Business Guide. The Dedham Business Guide is an amalgam of community marketing and small business outreach contained in a user-friendly guide that may be used in multiple ways – not just for local permitting and licensing, but also for providing important information about the steps in starting a small business. It’s designed to provide small businesses with information in an easy to understand format. It combines plainly worded, conversational style text with visually-interesting fonts and graphics. The Guide was designed by Harriman’s in-house graphic artist to create a unique look and feel using custom iconography. It lends itself to being distributed as an entire package or as individual topic related sheets and can be obtained online or by visiting Town Hall.